Shelley G. Rhodes, Member of the TB Research Group and IFNγ Test Consultant, Animal Health and Veterinary Laboratories Agency, UK. Bovine tuberculosis (BTB), caused by infection with Mycobacterium bovis, is characterized by a relatively early cell-mediated response, followed by a later humoral (antibody) response, this sequence of events being largely due to the intracellular nature of the infecting bacilli. 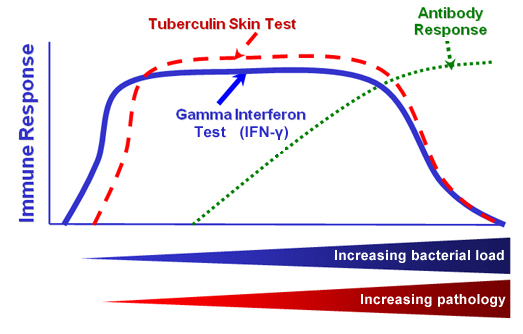 The cartoon below illustrates this progression of infection, with the appearance firstly of an interferon-gamma (IFNγ) response, followed by the appearance of a positive tuberculin skin test, and thereafter the development of a specific antibody response. The actual time course of such an infection of cattle in the field is unknown, but will be variable and dependent upon pathogen (e.g. dose) and host (e.g. immune competence) factors. In terms of human infection with M. tuberculosis, the time course from infection to clinical symptoms has been said to range from a few weeks to a lifetime. Fig.1. Immunology of Tuberculosi. The cartoon illustrates why measurement of the host's cell-mediated responses against the bacterium is the most sensitive way of detecting infected cattle. Until relatively recently the tuberculin skin test was the only test available for cattle TB testing, and remains the only mandatory TB test for cattle in Great Britain (GB). The single intradermal comparative cervical tuberculin (SICCT) test relies upon a delayed type hypersensitivity response to two tuberculin (PPD, purified protein derivative) preparations, one made from M. bovis (PPDB), and the other made from M. avium (PPDA). PPDA is used as a representative of background responses to general environmental mycobacterial antigens to which animals are exposed, while the PPDB component contains both these general antigens plus the M. bovis-specific antigens that are of interest. For a positive test, the response to PPDB must be greater than the response to PPDA. The sensitivity of the SICCT in GB was recently estimated at 81-85% (depending upon the interpretation used) (Karolemeas et al., 2012), while the specificity of the test in GB has been estimated in excess of 99.9%. This test is the primary BTB surveillance test for cattle in the UK and Ireland. The IFNγ blood test for BTB was developed in Australia (Wood et al., 1994). This test involves the stimulation of heparinized whole blood in vitro with PPDB and PPDA and measuring the comparative IFNγ response using an ELISA, the BOVIGAM® (Wood et al., 2001). The IFNγ test is marginally more sensitive than the skin test and, crucially, it can detect infected animals that are negative to the skin test. It is easier to standardize and quality control and can be repeated as often as necessary without causing desensitization to tuberculin in the tested animal. Several studies have shown that more infected cattle could be identified by using both the skin test and the IFNγ test in parallel, that is, removing animals that were positive to either test (summarized by Vordermeier et al., 2006 and Vordermeier et al., 2008). While the sensitivity of the IFNγ test can be high (around 90%, as recently described by Schiller et al., 2009) its specificity, estimated at 96.7% in GB (http://www.defra.gov.uk/animal-diseases/a-z/bovine-tb/animal-keepers/testing/gamma-interferon/), is not sufficiently high for this test to be used as a standalone routine screening tool. Since its official rollout in October 2006, the most common application of the IFNγ test in GB has been in conjunction with the tuberculin skin test in cattle herds suffering culture-confirmed TB breakdowns, in order to remove as many infected animals as possible. Approximately 30,000 IFNγ tests are carried out in cattle in GB each year. One major strength of the IFNγ test is that different antigens may be introduced in a continual effort to improve the test or adapt its performance characteristics to specific circumstances. The specific antigens ESAT6 and CFP10, found mainly in species of the Mycobacterium tuberculosis complex (MTBC), such as M. tuberculosis and M. bovis, are already used for re-testing of skin test reactor cattle where a higher specificity (99.2%) is required (see above DEFRA web reference, plus Vordermeier et al., 2001). ESAT6 and CFP10 are also used in the human IFNγ T-SPOT®.TB test (www.oxfordimmunotec.com), and the QuantiFERON®-TB Gold test (www.cellestis.com). The ESAT6/CFP10 antigens were recently included in the development of IFNγ tests for TB in both cats (Rhodes et al., 2011) and camelids (Rhodes et al., 2012). In BTB the ESAT6/CFP10 antigens are critical for the development of a DIVA (Differentiating Infected from Vaccinated Animals) IFNγ test that could, in the future, differentiate cattle vaccinated with BCG from those naturally infected with M. bovis (Vordermeier et al., 2011). Tuberculin preparations cannot perform this DIVA role, since BCG vaccination also stimulates a positive response to PPDB. However, as the ESAT6/CFP10 antigens are not expressed by the BCG vaccine strain, a positive response would appear only in the presence of natural infection. Such a DIVA test would be an absolute requirement should BCG vaccination of cattle against BTB ever be introduced into GB. While we continue to make progress to improve the IFNγ test for BTB diagnosis in cattle, there is mounting evidence that other cytokines may also have use in diagnostics, as markers of disease or immune protection. Jones et al (2010) showed that the use of IL-1-beta responses to ESAT6/CFP10, together with IFNγ responses could increase the sensitivity of detection of naturally-infected cattle by 5% without affecting specificity. IL-17 is of current interest in TB immunology, and recent work by Aranday-Cortes et al (2010) showed a BCG vaccination-induced Th17-related cytokine profile in mice that correlated with vaccine-induced protective immunity following infection with virulent M. bovis in the lung. Whether this is also true for vaccine-induced protection in cattle, and if so, whether a simple protein ELISA can be developed remains to be seen. Similar transcriptional profiling was also used to show increases in other cytokines, for example IL-22, in cattle naturally-infected with M. bovis, suggesting a potential role in diagnosis (Aranday-Cortes et al., 2012). Recently we have also developed an IL-2 ELISA assay for BTB in cattle, based upon the same whole blood culture and antigen-stimulation required for the IFNγ test (Rhodes et al., unpublished data). This test is currently under evaluation. Other cytokines, perhaps not traditionally associated with TB, nevertheless could also have a role in this immunopathological disease, and be of use. IL-4 production, for example, was identified using a bioassay following experimental infection of cattle with M. bovis (Rhodes, 2005). However IL-4 ELISA reagents to date have shown poor sensitivity of detection for this cytokine, which may act at low biological concentrations. 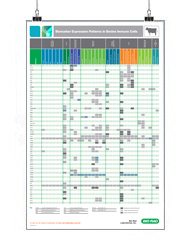 The IL4 gene has been shown to have antagonist splice variant products, IL4δ2 and IL4δ3. In our studies IL4δ3 expression was found to correlate with a lack of pathology in naturally-infected cattle, while a transient increase in this splice variant was found in two experimental models of protective immunity to M. bovis in cattle (Rhodes et al., 2007). While this information is tantalizing, without a sufficiently sensitive and robust protein assay/ELISA the role of IL-4 will remain an unknown. This is not the case for IL-10 however, where the detection of this cytokine revealed a role in a diminishing tuberculin skin test response following repeated testing of cattle naturally-infected with M. bovis (Coad et al., 2010). This work was in agreement with a previous report that described the antigen-specific production of IL-10 which reduced IFNγ responses, and the potential for IL-10 neutralization in the IFNγ diagnostic test in order to reveal cryptic M. bovis infection (Denis et al., 2007). These reports support a role for antigen-specific immune-regulatory cytokines like IL10 in both infection and diagnostic potential. This brief resumé describes only a very small proportion of the work from the AHVLA TB Research Group and our collaborators, investigating the use of cytokines for their relevance in BTB pathogenesis and for their potential application to diagnostics and possibly also as DIVA tests, which would be vital for the introduction of vaccination of cattle against TB. As an immunopathological disease, TB is driven by cytokine networks and it is the understanding of such networks that is the goal of immunologists hopefully providing positive diagnostic spin-offs along the way for the benefit of all. Aranday-Cort es, E., Kave h, D., Nu nez-Garcia, J., Ho garth, P.J. & H. Martin Vorderm eier. 2010. Mycobacterium bovis-BCG vaccination induces specific pulmonary transcriptome biosignatures in mice. Aranday-Cortes, E., Hogarth, P.J., Kaveh, D.A., Whelan, A.O., Villarreal-Ramos, B., Lalvani, A. & H.M. Vordermeier. 2012. Transcriptional profiling of disease-induced host responses in bovine tuberculosis and the identification of potential diagnostic biomarkers. Coad, M., Clifford, D., Rhodes, S.G., Hewinson, R.G., Vordermeier, H.M. & A.O. Whelan. 2010. Repeat tuberculin skin testing leads to de-sensitisation in naturally infected tuberculous cattle which is associated with elevated interleukin-10 and decreased interleukin-1 beta responses. Denis, M., Wedlock, D.N., McCarthy, A.R., Parlane, N.A., Cockle, P.J., Vordermeier, H.M. & R.G.Hewinson. 2007. Enhancement of the sensitivity of the whole blood gamma interferon assay for diagnosis of Mycobacterium bovis infection in cattle. Clin. Vaccine Immunol., 14(11): 1483-1489. Jon es, G.J., Pirs on C., Hewinson R.G. & H.M. Vordermeier. 2010. Simultaneous measurement of antigen-stimulated interleukin-1 beta and gamma interferon production enhances test sensitivity for the detection of Mycobacterium bovis infection in cattle. Karolemeas, K., de la Rua-Domenech, R., Cooper, R., Goodchild, A.V., Clifton-Hadley, R.S., Conlan, A.J., Mitchell., A.P., Hewinson, R.G., Donnelly, C.A., Wood, J.L. & T.J. McKinley. 2012. Estimation of the relative sensitivity of the comparative tuberculin skin test in tuberculosis cattle herds subjected to depopulation. PLoS One, 7(8): e3217. Pollock, J.M. & S.D. Neill. 2002. Mycobacterium bovis infection and tuberculosis in cattle. Rhodes, S.G. 2005. The cattle model of tuberculosis: studies in the natural host. In, Focus on Tuberculosis Research, p187-201. Nova Biomedical Books, New York. Ed. Lucy T. Smithe, ISBN: I-59454-137-X. Rhodes, S.G., Sawyer, J., Whelan, A.O., Dean, G.S., Coad, M., Ewer, K.J., Waldvogel, A.S., Anthony Zakher, A., Clifford, D.J., Hewinson, R.G. & H.M. Vordermeier. Is interleukin-4d3 splice variant expression in bovine tuberculosis: a marker of protective immunity Infect. Rhodes, S.G., Holder, T., Clifford, D., 1, Dexter, I., Brewer, J., Smith, N., Waring, L., Crawshaw, T., Gillgan, S., 4, Lyashchenko, K., Lawrence, J., Clarke, J., de la Rua-Domenech, R. & H.M. Vordermeier. 2012. Evaluation of IFNγ and antibody TB tests in alpacas. Clin. Vaccine Immunol., 19(10): 1677-1683. Schiller, I., Waters, W.R., Vordermeier, H.M., Nonnecke, B., Welsh, M., Keck, N., Whelan, A., Sigafoose, T., Stamm, C., Palmer, M., Thacker, T., Hardegger, R., Marg-Haufe, B., Raeber, A. & B. Oesch. 2009. Optimization of a whole blood gamma-interferon assay for the detection of Mycobacterium bovis-infected cattle. Clin. Vaccine Immunol., 16(8): 1196-1202. Vordermeier, H.M., Whelan, A., Cockle, P.J., Farrant, L., Palmer, N., & R.G. Hewinson. 2001. Use of synthetic peptides derived from the antigens ESAT6 and CFP10 for differential diagnosis of bovine tuberculosis in cattle. Clin. Diag. Lab. Immunol., 8: 571-578. Vordermeier, M., Whelan, A., Ewer, K., Goodchild, T., Clifton-Hadley, R., Williams, J. & G. Hewinson. 2006. The BOVIGAM assay as ancillary test to the tuberculin skin test. Gov. Vet. J., 16(1): 72-80. Vordermeier, M., Whelan, A. & G. Hewinson. 2008. The scientific case for the gamma-interferon BOVIGAM assay. Gov. Vet. J., 19: 38-43. Vorderme ier, M., Gordo n, S.V. & R.G. Hewins on. 2011. Mycobacterium bovis antigens for the differential diagnosis of vaccinated and infected cattle. Wood, P.R. & S.L. Jones. 2001. BOVIGAM: an in vitro cellular diagnostic test for bovine tuberculosis. Wood, P.R. & J.S. Rothel. 1994. In vitro diagnosis assays for bovine tuberculosis.